The internet is a place of a lot of bizarre things and every now and then we see videos breaking the internet. 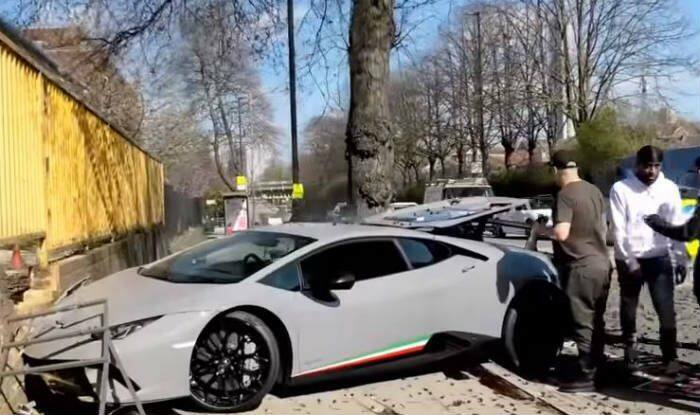 Now, a video is going viral on the internet where a sports car driver smashes his Lamborghini Huracan Performante sports car. The spectators present at the time of the incidents were left shocked. The car cost Rs Rs 2,28,25,369 crore. In the video, the owner of the sports car comes to an event to show off his sports car to the admirer’s but as soon as he drives off his brand new car, in less than a minute, he loses control and smashes it into trees and a brick wall. As per the reports, the driver lost his control when he was trying to cross the narrow lane but went out of control and crashed the car. After the crash, the driver broke down into the tears for damaging the expensive car. The video got instantly viral on social media and garnered one million views within a day. Luckily, no one was injured during the accident and even the driver escaped without any physical injury. Due to the accident, car’s bonnet was smashed and the boot was completely crushed after it was hit by a tree and the brick wall.